We thank of the Microsoft is innovating a site of the internet that we can safety vault our data using the internet. An online file hosting service that allow us to upload files and synchronize files to a cloud storage using our browsers. Unlike other cloud storage such as dropbox, Microsoft OneDrive offered a highest storage amounting to 15 GB for free of a new users. 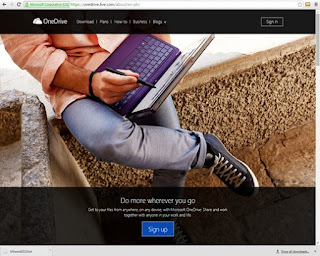 To start to use this cloud storage of the Microsoft just open this link in your browsers or click this link: OneDrive, you can start by signing up using the internet site. In the next pop up window, you need to select of the two under it. If for personal click signup for free. And if for business select business as start for trial. Next you need to click the signup link below of the user login bar of one drive. Then fill up the internet form provided by the site. Use a original name and complete profile information. Then if finish writing your information, type the capcha correctly under it. Just follow onscreen instruction after it. If you need to know what are the Microsoft Service agreement and privacy click the link provided. It''s better to know the tools we used. "End""